Shelf Actualization: Midnight in Paris: How did Woody do? In response to this post, reader Jillian22 has asked us to weigh in on Woody Allen’s portrayal of the various literary legends who figure so prominently in his recent film “Midnight in Paris,” the director’s love song to Paris in the ‘20s. Regular readers will doubtless already know that you don’t have to ask me twice to hold forth on that particular time and place. It’s a mild obsession. Handsome, opinionated, and self-assured, with machismo dripping from every pore, this is the Hemingway we’ve come to know and love. Don’t believe me? I’ll simply point you to this interview he gave to the Paris Review years later. Read the whole thing. It’s spectacular. We’ve thrown the spotlight on Hemingway’s speaking voice here, and I think the film measures up pretty well on that score, as well. My only complaint is that I doubt he was as extemporaneously eloquent, or nearly as bellicose as he is portrayed in the film. Other than that, spot on. I love Kathy Bates to begin with, but by all accounts, she nailed Stein’s role as a widely-used sounding board, art critic and social intermediary for the expat set. The short-cropped hair and husky figure are right out of the photographs of Stein in those days. And her Paris salon was where a lot of the movers and shakers came to move and shake. So it’s fitting that Gil would meet Adriana here. Affable, socially adept, and tragically in love with a category 5 tornado. Sounds about right. In the film, Hemingway clearly has it in for Zelda, warning Scott she’s out to destroy him. Scott finds himself uncomfortably defending his wife. Again, some pretty accurate echos of real life as they knew it. Hemingway tells the story in A Moveable Feast about how he dragged Scott through the Louvre to look at the naked male statues and alleviate the latter’s concern about the size of his junk. The only spouse to make the cut in a any major way (Hadley Hemingway was absent and Alice B.Toklas was nearly so.) I thought this was a decent cast. She was charming and outgoing, perhaps a little overbearing- and ready to come unhinged at a moment’s notice- not unlike the real McCoy. I have nothing to say here except where the devil was Joyce in this movie? He was the veritable dean of expat writers, and yet he only gets a mention as having been spotted in a restaurant once, eating sour kraut and frankfurters. Last summer I wasted an hour of my life watching the 1930 film L’Age d’Or on YouTube. This cinematic gem, written by Bunuel and Dali, is all the evidence you’ll ever need, to know that the exaggerated portrayal of those two surrealists in Woody Allen’s film is actually anything but an exaggeration. Dali’s fixation with “the horn of a rhinosceros” in his cafe chat with Gil fits in perfectly with the parade of surrealist non sequiturs you’ll find in l’Age d’Or. What say you? Have you seen Midnight in Paris? If so, do you agree or disagree with my take? Thank you for the post! I think you hit the nail on the head. I thought the exact same thing about Joyce (being a nut for the Irish writers of the time, I was severely disappointed that he didn't make it into the movie). 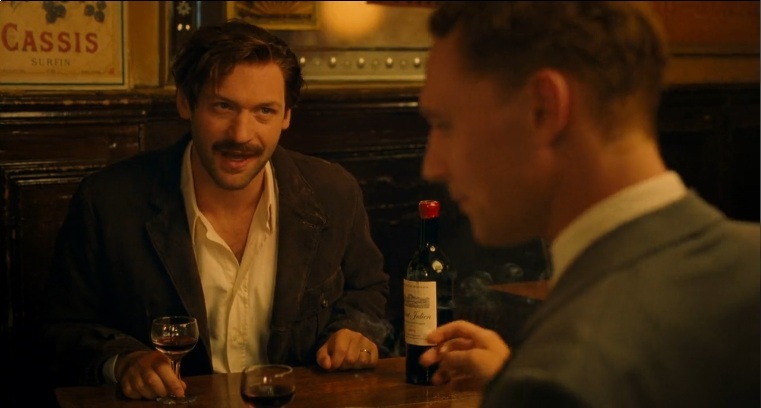 Adrien Brody's Dali made me laugh and the way that Corey Stoll perfectly captured how Hemingway spoke... priceless. I'd say he was my favorite character in the whole movie- watching him made me want to read some more Hemingway. Thanks again for the post... I loved it. Happy to do it. Sometimes half the work is coming up with an idea for a decent post. The research and writing is the fun part. So, thank you!